FAQ - Take a look here to find the information you need about shipping, returns, reward points, order tracking, gift certificates and more. We've put together a library of our customers most frequent questions with answers so you can quickly and easily find the information you need. If you don't see the answer you're looking for, simply send us an email and one of our knowledgeable customer service representatives will respond to you within 1 business day. Or, call us at 1-970-263-8381, Monday through Friday, 9:00 a.m. to 3:00 p.m. Mountain Standard Time. How do I change my order after I have checked out? How do I cancel an order after I have checked out? How can I add an item to my shopping cart? How can I view my shopping cart? How do I modify the contents of my shopping cart? Do you offer combined shipping between your sites? How do you handle out of stock items? Why won't my credit card go through? How secure is the MakeYourOwnBirdToys.com site? How do I opt-out of receiving communications from MakeYourOwnBirdToys.com? Can I write a review on a product? I would like to send a gift certificate to someone, how does this work? Select the option "create an account" during the checkout process. You will then create a password to use with your email address for future purchases. Enter the billing and shipping address(es) that will be stored with your account. Your password can be any string of characters (letters, numbers, spaces or punctuation) with a minimum length of 8 characters. Your user name is your email address and is case sensitive. You may change the email address by going into "My Account" and clicking on "edit" under the "Bill to Address" and "Ship to Address" sections. You will need to edit both manually. Be sure to click on "Save" after you make any changes. Your password can be changed from the "My Account" box by clicking on "Change My Password". You must provide your current password to make this change. If you ever forget your password, click on "Forgot Password?" and a temporary password will be sent to you to the email address you provided. Earn Reward Points - Check your reward point balance and track your reward point history. Faster Checkout - Your name and address information will automatically be entered whenever you log in making your checkout more convenient. Your personal information is not shared with unrelated third parties. View Order Status and History - You can easily check on the processing status of your order and look up your previous order history with complete details and reprint receipts for old orders. Easy Reorders - You can fast track your reorder process by looking up item details from previous orders. Gift Certificate Balance - Check the balance on any open gift certificates. Saved Carts - Your shopping bag contents are stored for 60 days allowing you to pick up shopping where you left off. Create a Wishlist - You can create a wish list of items you want to order later. Simply click on the "Details" button for the item you want, click "Add To Wish List" then click "Save" (You must click "Save" after every item is added). Your wishlist will not be deleted or modified which means you can come back to it at any time. From any category page, for the item of interest, click on the photo or the item name listed under the photo to proceed to the item detail page. On the item detail page, enter the desired amount in the "Order Quantity" box. Many items are offered at discounted prices based on purchase quantity. If quantity discounts are available they will be shown in a table under the unit price. Prices are represented on a per piece basis, however most items require a minimum purchase quantity. If the amount of your order exceeds available inventory you will receive an error message. Once you have added items to your shopping cart, you will automatically be taken to your shopping cart. You can also view it by clicking on the "view cart" link in the upper right corner of any page. From the shopping cart page you will have the opportunity to view your order, update your order, calculate shipping and tax or enter a promotional code for discounts, if applicable. The Shopping Cart will hold items for 60 days after your last activity on our Web site; however, merchandise availability is not guaranteed. Click on the "View Cart" link at the top of any page. Change the quantity listed in the box to the right of the product photo then click on the "Update" link under the box to modify and save your order. For any item you wish to delete, click the "X" in the delete column on the far right. The item will be automatically removed from your shopping cart. For all items, click the "X" in the delete column on the far right. The shopping cart will be cleared. From the "View Cart" page verify that the order is complete and accurate. From this page, you can update your order by changing or deleting item quantities. You can also add promotion codes, and calculate shipping and taxes. When you're ready to check out click on the "Proceed to Checkout" button to go to the One Page Checkout page. Click on the "Log In to Your Account" button. Existing customers: log in by entering the email address and password that was used when you set up your account. Verify the Bill to and Ship to addresses stored for your account. New customers: click on the "Create Account" button and be sure to enter accurate contact information. The address you enter will by default populate both the billing and shipping address field. Corrections can be made, if necessary, during checkout. Check "Yes I would like to be notified of product updates" box if you'd like to receive our monthly newsletter which contains sale notices and discount coupons. Select your shipping option (if applicable). Enter your "Coupon Code" (if applicable) and click on the "Go!" box to apply it to your order. Select your payment type and complete all the requested fields. Enter any special instructions in the "Comments" box. Click on the "Checkout" button to submit your order. Your order is now complete. Guest Checkout (without Creating an Account) – the option allows you to make a purchase without a password. Since the information will not be stored in our computer, subsequent orders will require retyping your billing and shipping addresses. Also, by using guest checkout you will not be able to earn reward points, save a shopping cart, easily process re-orders or track your order status. Upon submission of your order, an email receipt with details about your order will be sent to the email address provided. (please check your spam filters if you don't see it). From the order confirmation page you will also have the option to print a copy of your receipt. ***If you have any questions regarding your order, you can contact us via email and one of our knowledgeable customer service representatives will respond to you within 1 business day. Or, call us at 1-970-263-8381, Monday through Friday, 9:00 a.m. to 3:00 p.m. Mountain Standard Time. Yes! For customers who order from both www.MakeYourOwnBirdToys.com and www.SuperBirdToyStore.com , we can ship your orders together. Please cross reference your orders in the comments section so we know which orders to match up. Please note that orders which are submitted on different business days might not be able to ship together. To qualify for Free Shipping, at least one of your orders must be over $99.99. 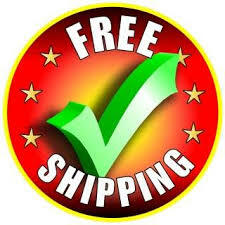 We do not give free shipping if neither order meets the minimum (i.e. a $65 order on one site plus a $35 order on the other will not get free shipping). We adjust the shipping rates after we receive your orders, and if a refund is warranted, the extra is credited back to you. If the majority of your order is in-stock, we will ship the available merchandise to you and notify you of the out-of-stock items. Our final charge to your credit card reflects only the items you receive, and you will not be charged for any out-of-stock items. We do not place items on back-order, but you can place a new order when new shipments are received. If more than 1/2 of your order is out-of-stock, we will contact you by email or phone to get your specific instructions regarding the order. For online orders we are glad to accept payment via MasterCard, Visa or PayPal. We also offer money order and personal or business check payment options for orders placed by mail or phone. You may use more than one payment option per order if you have a gift certificate or reward points to redeem. If you have a P.O. Box address printed on your check, please write your street address somewhere on the check. Returned checks are subject to a service charge of $35 or the maximum allowed by law. Collection costs and all penalties permitted by law will also be assessed. 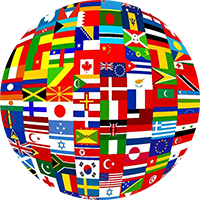 International customers, we invite you to use your MasterCard, VISA or PayPal for your online order. We do not accept checks for international orders. All payments must be in US currency. Payment must be received in full before an order can be shipped. Verify that your credit card number and expiration date are entered correctly. Verify that your credit card has not expired. Verify that you entered the correct security code. Make sure that your name and address match the billing address of your credit card. Gift certificates are redeemed during the checkout process. Enter the certificate code in the field labeled "Apply Coupon." Only one gift certificate can be redeemed per order. If you don't use the full amount of your gift certificate, please take care to save the certificate number as you will need to enter it for future orders until the balance is used up. You can easily keep track of your reward points and gift certificate balances by signing in at MakeYourOwnBirdToys.com and logging into your account. If you received a promotional offer from our newsletter or Facebook page, enter the promotional coupon code in the "Apply Coupon" field when you "View Cart" (be sure to click on "Go!") or on the "Payment Information" screen during the checkout process. Promotional discounts will appear as a dollar amount on the "Discount" line of your order confirmation. All coupon codes are issued with an expiration date. The shopping cart will display an error message if you use a code that is inactive or has expired. All offers are subject to change or may be discontinued at any time. Become a friend and "like us" on Facebook where we will publish our monthly promotions. You can access your account information by clicking on "My Account" in the menu bar. Once you are signed in, you can click on "Update Address" under the "Billing Address" and "Shipping Address" sections. Be sure to click on the"Update My Information" button at the bottom of the page after you make any changes. You can also edit your membership information during the checkout process when you've finished your changes be sure to click on "Continue". This will automatically save your changes. If you have completed check out (i.e., submitted your order after your payment information has been entered), you can process a change to an order by calling our Customer Service Department at 1-970-263-8381, Monday through Friday, 9:00 a.m. to 3:00 p.m. Mountain Standard Time. Note: The ability to process a change is based on the status of the order. Orders that have advanced to the fulfillment process cannot have items added or removed. If you have completed check out (i.e., submitted your order after your payment information has been entered), you can cancel an order by calling our Customer Service Department at 1-970-263-8381, Monday through Friday, 9:00 a.m. to 3:00 p.m. Mountain Standard Time. Note: If your order has shipped, it cannot be canceled. We offer refunds or replacements for broken or damaged products. If you receive a broken or damaged product you must notify us within 48 hours of receiving your order. We recommend that you inspect your order thoroughly upon receipt. The system stores your email address and password exactly as you created them when you established the account. If you are unable to log in to your account, the email address and/or password do not match what is on file. Any differences in capitalization, punctuation, spacing or spelling will prevent you from accessing your account. To protect your privacy, we do not have access to your password. If you have forgotten your password, just click on the "reset my password" link on the customer log in screen and we will send you an email with a link to reset your password. You can reset your password by simply clicking on the "Update Address" link found on your "My Account" page. Super Bird Creations, LLC dba MakeYourOwnBirdToys.com is required by law to collect sales tax on all retail orders shipped within Colorado. The appropriate charges will be added to your merchandise total and displayed on your final order confirmation. We understand that you're concerned about the security and privacy of your online transactions. 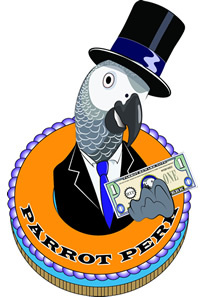 MakeYourOwnBirdToys.com uses Secure Socket Layer (SSL) technology to ensure that your valuable data, such as credit card details, are encrypted when you interact with our site. Our SSL certificate is issued by a leading certificate authority, GoDaddy. GoDaddy is Web Trust-compliant, meaning that their business practices and processes have been rigorously audited according to AICPA (American Institute of Certified Public Accountants) guidelines by an independent approved auditor (Ernst & Young). GoDaddy SSL certificates enable a high level of encryption. They also confirm that a company is a legally accountable organization. To receive a SSL Certificate from GoDaddy, we had to demonstrate to them that we are an existing business, along with our control over the domain you are visiting. When you shop online, you deserve to know who you are interacting with. That this website represents a real organization. Shopping with MakeYourOwnBirdToys.com is 100% secure - guaranteed! When you place an order or sign up for information, we ask for your name, address, telephone number, e-mail address and so forth. Your name and address information is used solely for verifying your identity and processing your order. It is imperative that you provide us with accurate contact information in the event we have a problem with your order. We do not purchase, sell or share names or any other information about our customers with unrelated third parties. We will not disclose any personal information unless required by law to do so. Information contained within general email inquiries is used solely for the purpose of responding to your inquiry. We will occasionally send notices of special events and sales to our customers if they have requested it. We will always give you the opportunity to be removed from our e-mail mailing list. To unsubscribe from exclusive information on bargains, sales and Internet-only sales just click on the unsubscribe link found in any of our emails. Sorry, but we do not have a print catalog available. Yes, we do offer wholesale pricing to qualified pet related businesses and 501c3 animal organizations. Please follow the "Wholesale Info" link in our footer for more information. Our mission at MakeYourOwnBirdToys.com is to make you and your bird smile! We are confident you will appreciate the selection and value we have to offer. 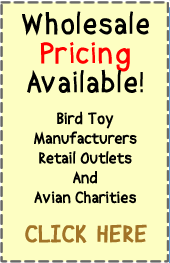 MakeYourOwnBirdToys.com is committed to making your buying experience easy and convenient. Your satisfaction is our number one priority. If you are not 100% satisfied with your purchase, contact our Customer Service Department at 1-970-263-8381, Monday through Friday, 9:00 a.m. to 3:00 p.m. Mountain Standard Time. If something is missing or damaged we'll happily replace the item or refund the cost of it. We'll make it right! Our online chat support is available Monday through Friday, 9 am to 3 pm Mountain Standard Time. On any category page, click on the image of the product you want to review to go to the product detail page. The "Add Review" box will open and you will be requested to supply your name, email address, location, your personalized review and a 5 star rating option. No worries, your email address will not be published on the site. Once complete, click the "Add Review" button. To prevent spam abuse by evil robot spammers we unfortunately check all reviews before they post. Because of this, it may take up to 48 hours for your review to appear on the site. Sending a gift certificate is very easy, just click on the "Gift Certificates" link in the "Categories" list found on the left sidebar menu. The Gift Certificates page will open where you can choose the amount of the gift certificate you would like to send by clicking "Add to Cart." Our gift certificates may be purchased in increments of $2, $5, $10, $20, $50 and $100. On the Gift Certificate detail page you will be requested to fill in the "From" and "To" fields as well as write a message to the lucky recipient. Type in the recipients email address (please double check the email address) then click "continue". Once the checkout process is completed our shopping cart will automatically send the recipient a gift certificate code via email. If you don't use the full amount of your gift certificate, please take care to save the email with your certificate number as you will need to enter it for future orders until the balance is used up. To check your balance, just log into your account and scroll to the Gift Certificate section on your "My Account" page. Enter your certificate code in the box labeled "Check Certificate" to view your remaining balance. 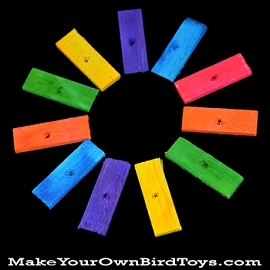 Every purchase you make at MakeYourOwnBirdToys.com earns you points which you can redeem towards future purchases. You earn one point for every dollar spent. Points are calculated on the merchandise value only after discounts. 50 points equals $1.00 (500 points is equal to $10.00). You can easily keep track of your reward points by signing into your account. Your current point balance as well as your reward point history can be found under the "My Account" section at the bottom of the page. Reward points cannot be redeemed for cash under any circumstance. Shipping and taxes are excluded from the reward point calculation. To redeem a gift certificate just enter the code you receive via email into the coupon code field during checkout. To review your reward point balance you will need to log in to your account. Under the "My Account" section you will see your current reward point balance. There is also a "View Details" link that you can use to see your reward point history. Upon completion of your order you will receive an email letting you know that your order was received. Once your order is shipped you will receive a second email with the tracking number and the shipper's name (either FedEx or USPS). By signing into your account and locating your order under "Order History". If you click on the "Order #" the order details will appear including the tracking number. By clicking on that linked tracking number you will be able to access the detailed shipping status. If you have any questions regarding your order, you can contact us via email and one of our knowledgeable customer service representatives will respond to you within 1 business day. Or, call us at 1-970-263-8381, Monday through Friday, 9:00 a.m. to 3:00 p.m. Mountain Standard Time.